Jacorma is a rare and very late Peony. It’s blooming in the same period as Elsa Sass and Ann Cousins. 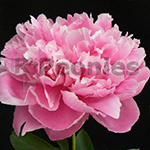 This extreme beautiful of the purest Pink and double Peony is an absolute winner. With flowers up to 15 cm and the dark foliage Jacorma is used a lot for cut flower crops as well for landscaping in gardens and city parks. Every year older the plant gives more and more flowers.